His club finished on the losing side but it was hard to dispute Windsor Stars' goalkeeper Anthony Santilli was man-of-the-match in TFC Academy’s 2-0 win on Sunday. Time and again, the thirty-two year-old keeper sprang from side to side, making fingertip saves to keep his team in the League 1 Ontario Soccer match against the undefeated machine of TFCA, at the Kia Training Ground in Toronto. The victory moves TFC Academy top-of-the-table in a tight-night bunch with twenty-seven points on eight wins and three draws after eleven matches played. 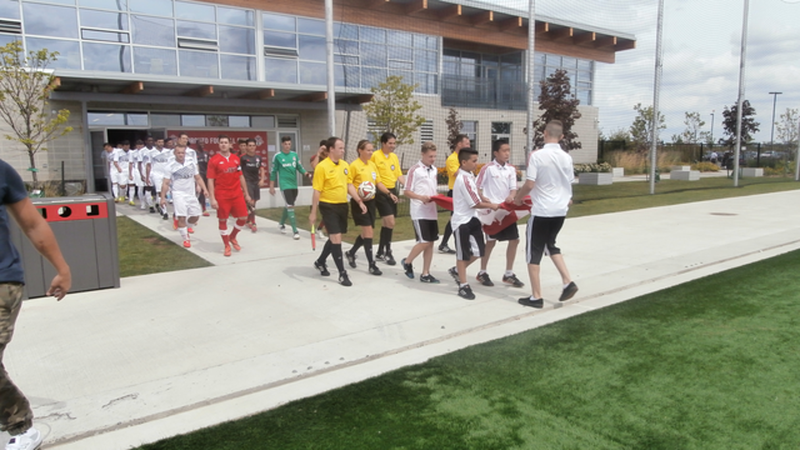 They’re a point ahead of second-place Vaughan Azzurri who have played twelve games. Sigma FC are third on twenty-four points after twelve games played, and Woodbridge Strikers are fourth with twenty-two points after eleven matches played. Windsor follow in fifth with sixteen points, having played eleven games. It was always going to be a challenge for Windsor, after a four-hour bus ride and a battle with one of the league’s top teams. But Santilli was determined to keep the ball out of the net, and was challenged especially by TFCA danger man Marcos Nunes, a seven-goal scorer this year, and who was on fire in the first half, hammering balls at the net from all angles. Early on, he drilled a left-foot shot to the top corner that Santilli just got a hand on. A free kick from Nunes was destined for the corner, but, again Santilli got a hand on it and it went off the post. The other major threat for Toronto FC Academy, league-leading scorer Molham Babouli (who has 17 goals this season) always looked threatening every time he neared the penalty area, and had the best chance of the game early in the second half but could not beat Santilli. Finally, though, a feed from Anthony Osorio found Marco Rodriguez who slotted home a sitter to make it 1-0 in the sixty-fourth minute. Soon after, Babouli’s replacement and another scoring threat, Stefan Vukovic, slid by several tiring Stars defenders and went across goal to beat Santilli going the wrong way to make the final, 2-0. Phil Di Bennardo had just a few chances to deal with in the TFCA goal and was equal to the task to keep the clean sheet. After the match, Santilli, a longtime pro keeper in the Canadian Soccer League, was modest about his game, though without his saves TFCA could have had four or five more goals. “I don’t think I did anything special, just what I’m expected to do as a goalie back there and a leader on the team. I felt like I had a decent game. I still feel like those two goals that I let in weren’t the best of goals, I think I still should have had those,” said Santilli, who also wore the captain’s armband. “I still feel it was a good performance as a unit and we’ll just go home and work on what we need to,” said Santilli. Toronto FC head coach Michael Stefano was thrilled with the play of his team. “We were fantastic. We were unbelievable on the day,” said Stefano. “Their keeper was very good today. He made some real good saves. We were creating a lot of chances. At halftime I spoke to the boys. I said, don’t stop doing what you’re doing,” Stefano said. Windsor has to make the trip to Toronto again next weekend when they face Master’s SA Saints at L’Amoureux at 3 p.m. on Saturday, Sept. 6. Toronto FC Academy have another home date at Kia Training Ground next Sunday, Sept. 7, at 1 p.m. when the opposition will be Kingston Cataraqui Clippers.